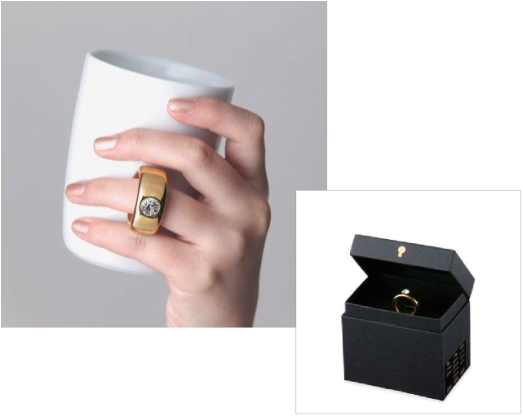 To fit the ring to your finger, slide your middle finger or ring finger through the handle of the cup. When you drink from this Ring Cup while holding the cup in your hand, it will appear as if you are wearing an actual ring. Sparkling SWAROVSKI ELEMENTS are embedded in the head of the “ring” handle of this cup, which sits beautifully inside its box, specially designed to resemble a jewelry case. We hope you truly enjoy the story and design of this unique mug and case set, from the moment you open the lid, to the moment you hold the mug in your hand and place the “ring” upon your finger. Our mission at Floyd is to bring excitement, surprise, and smiles to all. We are proud to have captured the essence of our mission in our design masterpiece, this Ring Cup.